When you are at a point in time where you are acknowledging that something is fresh and new about your experience of reality, that is certainly something for all of you to celebrate. Celebrate the acknowledgement that life is forever changing and is forever moving forward in a positive direction, for you and for everyone else in the human collective. 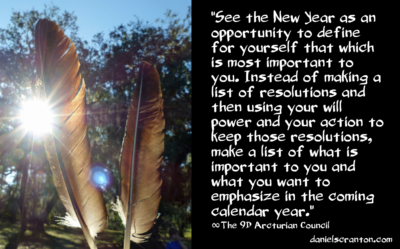 See the New Year as an opportunity to define for yourself that which is most important to you. Instead of making a list of resolutions and then using your will power and your action to keep those resolutions, make a list of what is important to you and what you want to emphasize in the coming calendar year. You have, of course, many downloads coming to you as you step into the New Year, and those downloads are coming because we sense your openness and your receptivity to that which is new, to change, and to creating a new version of yourselves. Isn’t that what you are always doing? As you create the new you, you bring in more energy. You access more of who you really are, and isn’t that necessary to continue to move forward, to continue to keep up with these energies? You must recognize who you really are and allow yourselves to be that. As you allow yourselves to exude love, to come from your hearts, you bring about a new age, a new era, and you usher in the shift in consciousness. This is a tumultuous and wonderful time to be alive on planet Earth. Let yourselves feel the significance of the movement forward that you are making, and feel for the support that you have from your guides and from so many other beings, as you embark upon this latest step forward in your journeys. We ask that you remain open, receptive, and keep your sense of freshness for as long as you can, so that eventually you feel the same way about a new day, every day, as you do this New Year that you are inviting in.